Gov. 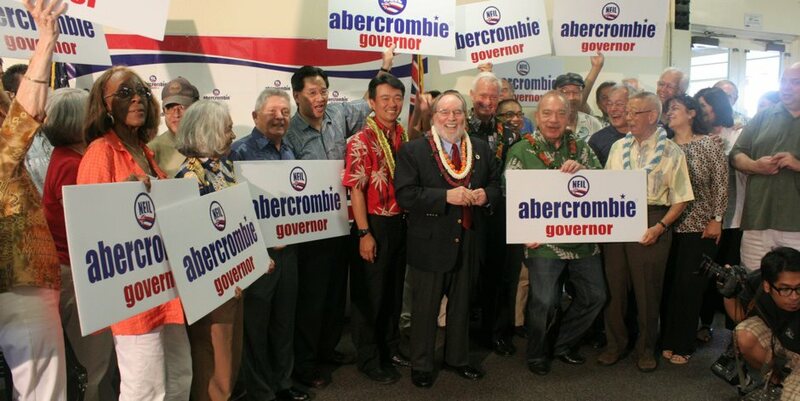 Neil Abercrombie brought in more than $859,450 over the past six months for his re-election campaign, swelling his total to $3.3 million overall. The Democrat had $2.1 million in cash on hand at the end of June, according to his latest campaign-finance report. Star-Advertiser. Neil Abercrombie’s re-election campaign raised $860,000 in the first six months of 2013, according to a statement from his gubernatorial campaign Wednesday afternoon. Civil Beat. Why has Hawaii's state government relegated itself to a 20th-century business model, clinging inefficiently to paper as other states dive into digital? Sonny Bhagowalia, who has been Hawaii’s IT czar for two years, has laid out a comprehensive plan to propel the state into the 21st Century. But he said it won’t come to fruition without funding — or at least not as fast as it should. Civil Beat. The Hawaii Invasive Species Council is allocating more than $2.5 million for dozens of projects during the current fiscal year, including efforts to eradicate axis deer on the Big Island and detect mongoose on Kauai. Associated Press. After one unsuccessful attempt Honolulu Police plan to try again to use cameras capable of reading multiple license plates a second. Police Department's in other cities across the country say the technology has helped recover stolen cars and catch wanted criminals. But opponents say it also catches too much information. Hawaii News Now. Honolulu Mayor Kirk Caldwell and other officials joined Hawaiian civic club members in celebrating the 170th anniversary of Hawaiian Flag Day, the day the Hawaiian monarchy was restored, and the founding of Thomas Square at the Honolulu park on Wednesday — with a backdrop of supporters of Hawaiian sovereignty and (de)Occupy Honolulu protesting behind them. Star-Advertiser. It’s a problem some Oahu residents say happens too often. Garbage is overflowing, trash pickup routes are missed, and the city is paying out tens of thousands of dollars to make up for the trash trouble. KHON2. The appointed Grants In Aid Advisory Commission this week submitted to the City Council a list recommending that 41 Oahu nonprofit agencies divvy up $5.1 million in grants. Star-Advertiser. The National Football League and the NFL’s Players Association is giving the annual Pro Bowl all-star game, which is being held on Jan. 26 at Aloha Stadium in Honolulu, an overhaul. Pacific Business News. A friend of State Department special agent Christopher Deedy testified Wednesday she saw the agent pull out his wallet before the 2011 fatal shooting in Waikiki and show Kollin Elderts what the defense asserts was Deedy’s law enforcement identification and badge. Star-Advertiser. The Environmental Management Department is getting lots of pitches for waste-to-energy technologies, Director Bobby Jean Leithead Todd told Environmental Management Commissioners Wednesday morning. The problem is, she added, most of those technologies aren’t a good fit for Hawaii County. Stephens Media. Hawaii County Council members got off to a slow start raising money for their next campaigns, with only one councilor, Hilo Councilman Dennis Onishi, reporting any contributions at all, according to disclosures filed with the state Campaign Spending Commission by Wednesday’s deadline. Stephens Media. The Pacific Islands Parks Act was given an important hearing at a key Senate committee today. The legislation, which was introduced by Hawaii Senator Brian Schatz, would direct the National Park Service to complete studies of three designated sites in the state of Hawai‘i. That includes a special resource study along the Ka‘u Coast on Hawaii Island, as well as the northern coast of Maui, and the southeastern coast of Kauai. Big Island Video News. Updates to the Maui County Code relating to subdivisions, including one that could help the county regulate speeding on Eha Street, were signed into law by Mayor Alan Arakawa on Tuesday. Maui News. Maui police issued a total of 634 tickets, 530 of them for speeding during the Operation SPEED traffic enforcement campaign last week. Maui Now. Habitat for Humanity Maui announced the start of construction on a 16 unit condominium project on Kahawai Street in Happy Valley. Maui Now. More than 1,000 people came to Kauai Veterans Center Wednesday to attend a public hearing on a proposal that has put Kauai on the spotlight across the state and has sharply divided island residents. Garden Island. Supporters and opponents of a controversial bill to regulate pesticides and genetically engineered crops crowded the Kauai Veterans Center Wednesday to testify before a County Council committee. More than 1,000 people attended the hearing Wednesday on Bill 2491. Star-Advertiser. Although relatively peaceful — other than the occasional snicker, laugh or boo from the audience — testimony during Wednesday’s public hearing on County Bill 2491 was full of emotion from both sides. Garden Island. The public is invited to provide input on the proposed update of the Kauai County Area Plan for Oct. 2011 to Sept. 2015, which serves as a blueprint for senior programs and services. Included in the update are proposed changes to the Agency on Elderly Affairs’ services and several of its programs including: Better Choices, Better Health; EnhanceFitness; and the Kauai RSVP (Retired Seniors Volunteer Program). Garden Island. If someone were to play Larry Ellison in a movie, the Oracle Corp. CEO thinks it should be Robert Downey Jr. Pacific Business News.